Matthew Castriotta, Mike Ryan and Derrick Davis from transportation provider ReedTMS weigh in on the Electronic Logging Device mandate and its enforcement, its effect on the green industry, and how businesses can improve their shipping processes. This entry was posted in Uncategorized on April 2, 2018 by ReedTMS. Just because you weren’t affected by last week’s ransomware attack doesn’t mean your safe. Please make sure to take the following precautions to ensure your safety. Don’t click links, or open any attachments, you receive in unsolicited emails or SMS messages. The links may lead to malicious websites, and any attachments could be infected with malware. Always install software updates as soon as they’re available. Whether you’re updating the operating system or an application, the update will often include fixes for critical security vulnerabilities. Install anti-virus software on your computer and mobile devices, and keep it updated. Bear in mind ransomware can often be picked up by visiting disreputable websites including illegal movie streaming websites and some adult sites. Don’t pay extortion demands as this only feeds into criminals’ hands, and there’s no guarantee that access to your files will be restored if you do pay. This entry was posted in Uncategorized and tagged Cyber, Security on July 5, 2017 by ReedTMS. Amazon’s offer represents a 27 percent premium to Whole Foods’ closing price on Thursday. With Whole Foods shares trading around Amazon’s offer price, investors appear to be speculating that another suitor could make a play for the grocery chain. Whole Foods has been under pressure from activist investor Jana Partners and money manager Neuberger Berman, which have called on Whole Foods to sell itself. The investors have criticized Whole Foods for its poor performance, and have suggested the chain could be merged with another grocer. “This partnership presents an opportunity to maximize value for Whole Foods Market’s shareholders, while at the same time extending our mission and bringing the highest quality, experience, convenience and innovation to our customers,” John Mackey, Whole Foods’ CEO, said in a statement. Amazon has long been pushing to expand its online grocery business, seeing it as an emerging opportunity. Currently, very few people purchase their groceries online even as more shoppers switch to buying other goods that way. Some analysts had seen Wal-Mart being best positioned to compete in the next phase of growth in online shopping because it was going to be able to use its vast footprint of stores to help distribute products ordered online. Also, Wal-Mart has been successful with its so-called click-and-collect model, where shoppers order online but stop by the store to pickup their orders. Meanwhile, Whole Foods has been seen as a laggard in the online shift. Their stores tend to be in urban markets where there was an overlap with Amazon Fresh and Prime Now. News that the e-commerce giants buying grocery store Whole Foods sent grocery stocks reeling on Friday. Kroger sank nearly 16 percent before the bell. Supervalu dropped 11.5 percent while Costco dropped 6.5 percent. Sprouts Farmers sank 9.2 percent. Shares of Amazon were up about 3 percent following the news. The deal is expected to close in the second half year. Jana Partners did not immediately respond to CNBC’s request for comment. This entry was posted in Uncategorized and tagged amazon, logistics, produce, Wal-Mart on June 16, 2017 by ReedTMS. Talk of freezes in the East and blustery rain in the West will be well in the past as volumes kick into gear for the Fourth of July. Avocado prices remain high, and will likely remain so through July 4th, but supplies will remain healthy from California and Peru, even as Mexico’s season winds down, marketers say. “Just kind of looking forward with what we expect supplies to be, it’s going to be fairly steady but not an overwhelming amount of fruit available,” said Robb Bertels, vice president of marketing with Oxnard, Calif.-based Mission Produce Inc.
Volume across the U.S. will continue to trend in the low- to mid-40 million-pound a week range, Bertels said. Avocado prices have remained “relatively high,” and likely will stay so through the holiday, said Phil Henry, president of Escondido, Calif.-based Henry Avocado Corp.
“It doesn’t seem like there will be any major changes,” he said. Rob Wedin, vice president of sales and marketing with Santa Paula, Calif.-based avocado gower-shipper Calavo Growers Inc., said prices could rise as the holiday approaches. “We could see a relaxation in next couple of weeks, but as we get closer to Fourth of July, we’ll see some minor strengthening of prices, which is pretty normal,” he said. Homestead, Fla.-based Brooks Tropicals is seeing increased volumes of Florida avocados, said Bill Brindle, vice president of sales. “This year’s crop Is sizing up heavier than the last two years,” he said. July 4th arrives just as New Jersey’s blueberry season is peaking, so supplies should be no problem, said Bob Von Rohr, marketing and customer relations manager at Glassboro, N.J.-based Sunny Valley International Inc.
A plentiful supply of strawberries will be available to cover the “red” part, said Cindy Jewell, marketing director with Watsonville, Calif.-based berry grower-shipper California Giant Inc.
“You can expect plenty of fruit. It’s one of those years that everything’s going to be in alignment with weather, quality and flavor,” she said. Cal Giant’s blueberry, raspberry and blackberry crops should be ready for the Fourth, as well, she said. “Strawberries coming into peak the last two weeks in June and will stay that way through mid-July, but you’ve also got blackberries and raspberries coming in, with blueberries and cherries coming in around July 4,” she said. Quality and quantity won’t be a problem in the watermelon market for the Fourth of July, said Mark Arney, executive director of the Winter Springs, Fla.-based National Watermelon Promotion Board. Volume should be adequate as the holiday approaches, Arney said. “Of course, we just don’t know; weather is always a wild card,” he said. Sweet corn growers said they’d be ready for the holiday. “Should be standard issue, with good supplies out of Georgia,” said Jason Bedsole, sales manager with Duda Farm Fresh Foods Inc. in Wellington, Fla.
Calvert Cullen, owner of Cheriton, Va.-based Northampton Growers Produce Sales, said his crews will be harvesting sweet corn in Moultrie, Ga., until around July 4 and was getting set to start in North Carolina. “We expect good supplies, as long as the weather doesn’t (interfere),” he said. Northampton also was harvesting squash, cabbage and green beans in Moultrie, as well as bell peppers, hot peppers and eggplant in North Carolina. Gilroy, Calif.-based Uesugi Farms is expecting promotable volumes of sweet corn in time for the July 4th holiday, said Pete Aiello, general manager. “It’s a little far out there to anticipate what kind of markets we’re going to see, but the Fourth is always a popular pull for sweet corn, obviously, so the demand will be there and we will definitely have supply,” he said. The crop was looking good June 1, he said. Oak Grove, Va.-based Parker Farms will actively promote its sweet corn coming out of Georgia for the holiday and will have enough of its Virginia crop to help supplement supplies, said Sean McFadden, business development director there. “We have a lot of corn in Georgia that we will be supporting ads with,” he said. This entry was posted in Uncategorized and tagged July 4th, produce, transportation on June 2, 2017 by ReedTMS. Arlington, VA – Traffic congestion on the U.S. National Highway System (NHS) added over $63.4 billion in operational costs to the trucking industry in 2015, according to research released today by the American Transportation Research Institute (ATRI). Utilizing a variety of data sources including its unique truck GPS database, ATRI calculated delay on the NHS totaling more than 996 million hours of lost productivity, which equates to 362,243 commercial truck drivers sitting idle for a working year. ATRI’s analysis also documented the states, metropolitan areas, and counties that were most impacted by these delays and subsequent cost increases. The top 10 states experienced costs of over $2 billion each, with Florida and Texas leading with over $5 billion each. As expected, traffic congestion tended to be most severe in urban areas, with 88 percent of the congestion costs concentrated on only 17 percent of the network mileage, and 91 percent of the total congestion cost occurring in metropolitan areas. This concentration of congestion has been well-documented in ongoing work by ATRI which annually identifies the worst truck bottlenecks in the U.S. The analysis also demonstrates the impact of congestion costs on a per-truck basis, with an average increased cost of $22,676 for trucks that travel 100,000 miles annually. As part of this analysis, ATRI has updated its congestion cost database with 2015 data to provide granular cost information to transportation planning officials on the hours of delay and associated cost by major jurisdiction type and road level. 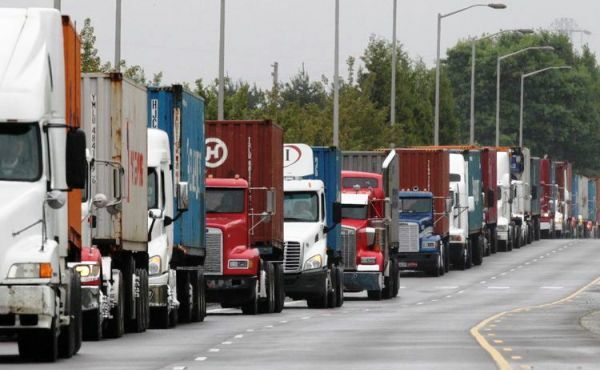 “Congestion-related costs continue to rise and impact our supply chains. A five minute delay for each UPS vehicle, every day, costs UPS $105 million annually in additional operating costs. ATRI’s report quantifies this drain on the economy which must be addressed through targeted infrastructure investments,” said Rich McArdle, President of UPS Freight. This entry was posted in Trucking News, Uncategorized and tagged logistics, Tampa, trucking on May 16, 2017 by ReedTMS.